The brand-new article quoted below was published this morning by some usually well-informed however strictly anti-communist Chinese daily, the Epoch Times 大纪元 . What's the direction of North Korea's change ? In recent days, North Korea showed its rather new inclination to direct talks with its arch-enemy the U.S. administration of Donald Trump. At the same time it becomes obvious that North Korea's position towards China has changed during the years of fruitless anti-nuclear talks and which finally led to China supporting new sanctions imposed on its former ally. From there, China has step by step come into the focus of a possible North Korean revenge and which makes China to become just another target for North Korea's nuclear blackmail, even more as many of China's civilian high-value targets are within missile-reach of North Korea. 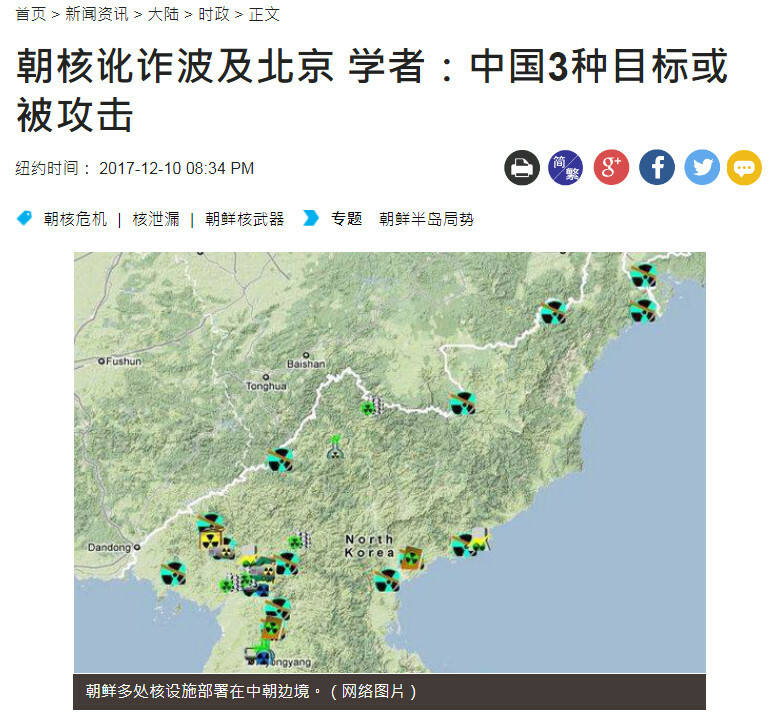 In the frame of a possible North Korean revenge, the Epoch Times author is considering three potential first level targets like Beijing, Shanghai and the Three-Gorges-Dam, such including the administrative and economic centrals of China. 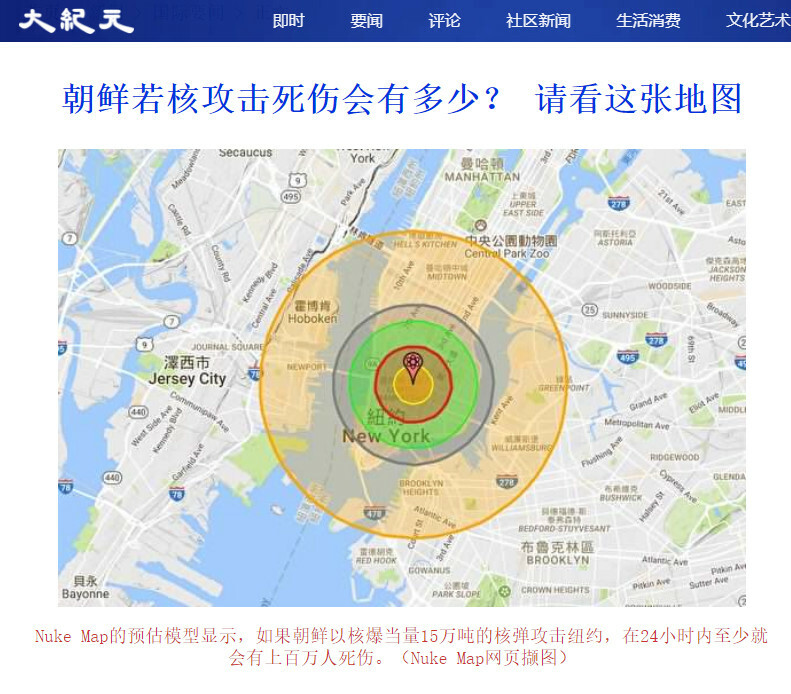 Further second level targets like China's nuclear power centrals should be endangered as well. Even command operations of North Korean elite troops using biochemical weapons in China should not be excluded. It is anyway regarded as an established fact that China's leadership is sensing dramatic changes being in progress in North Korea. 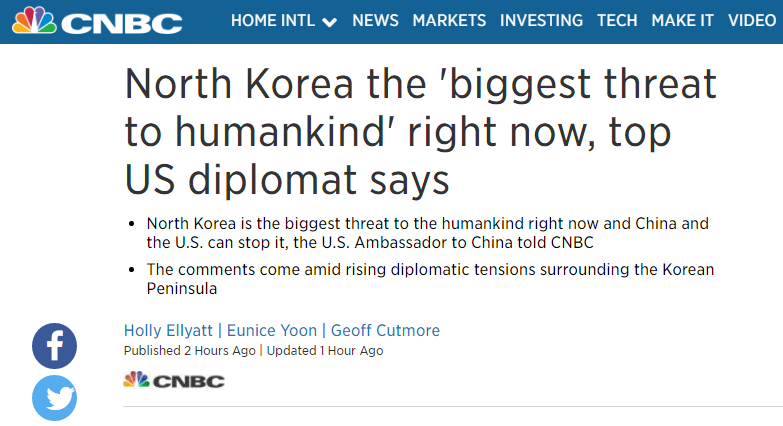 How else could it be that China is planning camps to canalize possible waves of North Korean refugees from economic disaster and/or the dangers of war. Even Kim Jong-un seems to be underway in his own country for some reason. According to the Chinese source he should have travelled to the mountaineous region near Mount Paektu which he hadn't visited during winter time for many years and where nuclear installations are in reach. The following Chinese language document only recently appeared on the web. 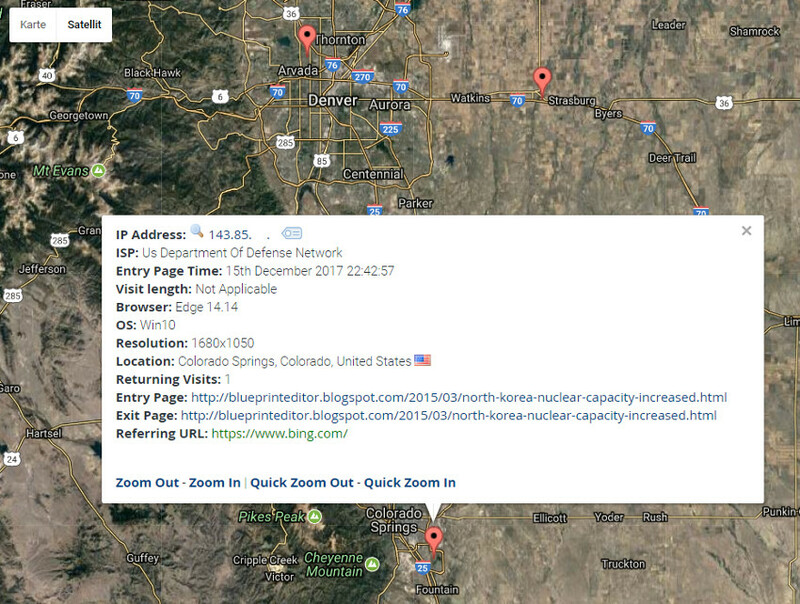 It is directly referring to the construction of refugee camps for North Koreans in China's Jilin province. 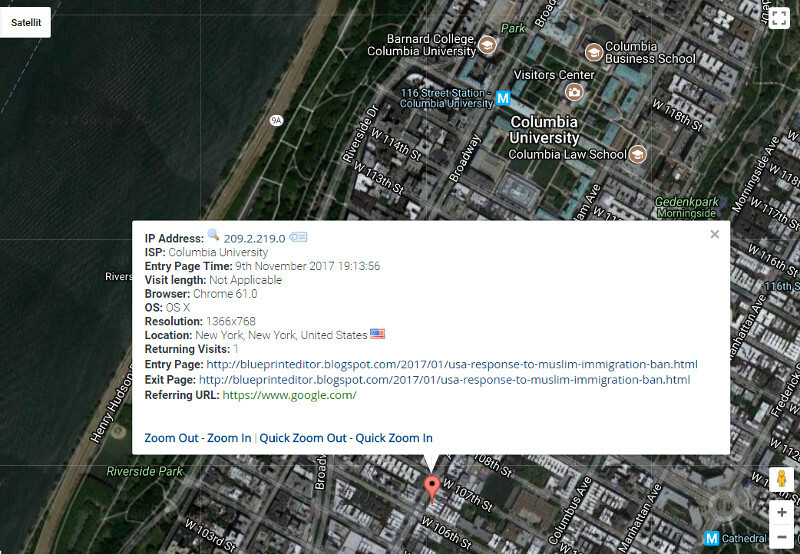 To prevent N Korean refugees from surging in ? Jilin is planning to set up refugee camps. 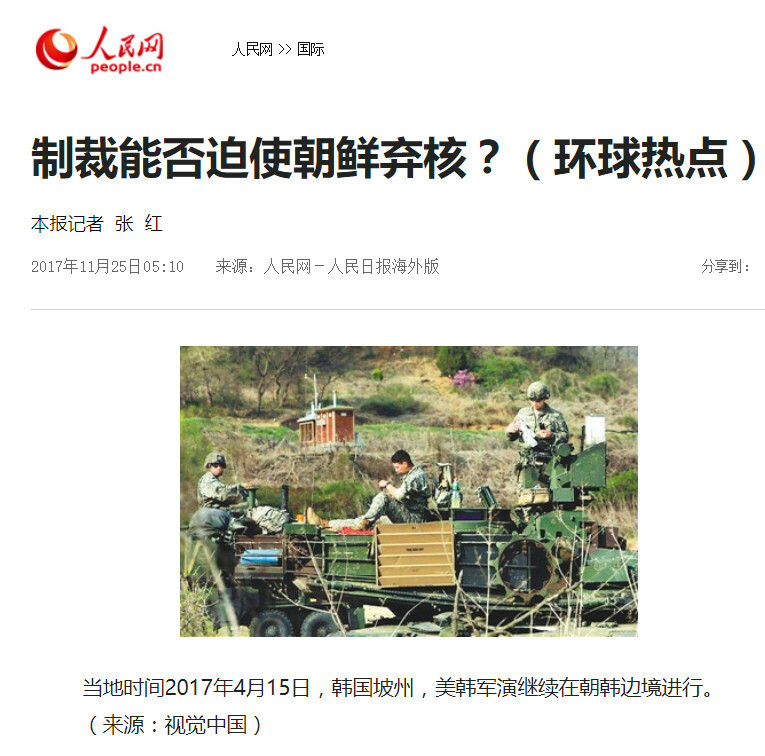 HongKong based Chinese language media provided the above shown copy together with a hint at some site near the Chinese - North Korean border named "Duck Green River 鸭绿江" and which is referring to the Yalu River. This border region is known as a former battlefield in different wars since the end of the 19th century including the Korean War in the 1950ies. "China messenger service of Jilin province, BaiShan [city] branch" with Baishan 白山 meaning "White Mountain" and which refers to nearby Paektu Mountain in neighbouring North Korea. Update added on December 11. United Nations envoy Feltman told the North Koreans there can only be a diplomatic solution. North Korea's nuclear blackmail is affecting Beijing. Scholar: Three targets for probable attack in China. The article is mentioning the possibility that nuclear blackmail from North Korea could not be restricted to the U.S., Japan and South Korea but as well extend to Chinese targets. Uncertainty about a problem of interior movement in China. 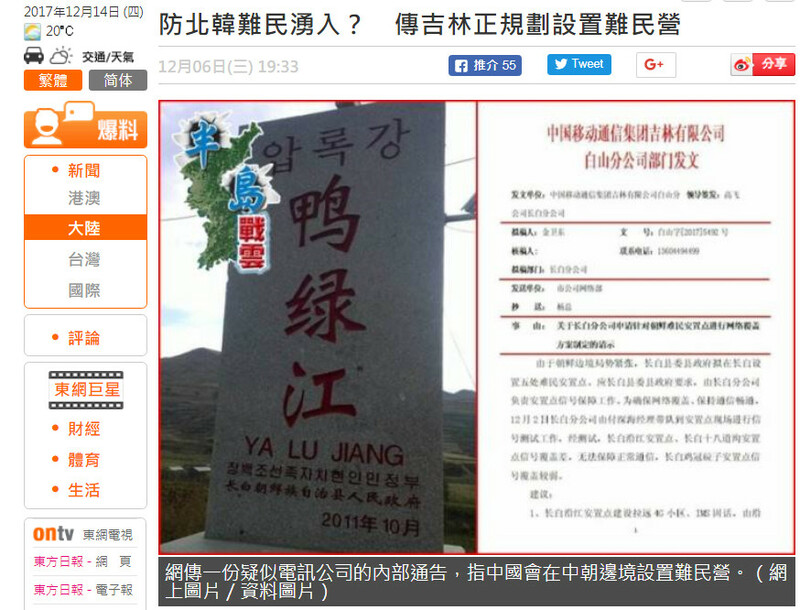 Indications that Jilin [province] is planning 5 refugee camps. Updates added on December 9 / 10. 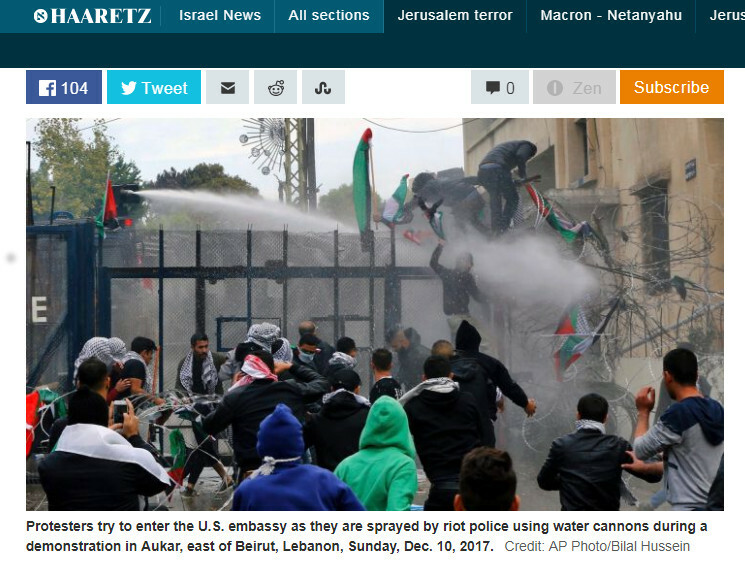 U.S. embassy in Beirut, Lebanon, under siege of protesters on December 10. 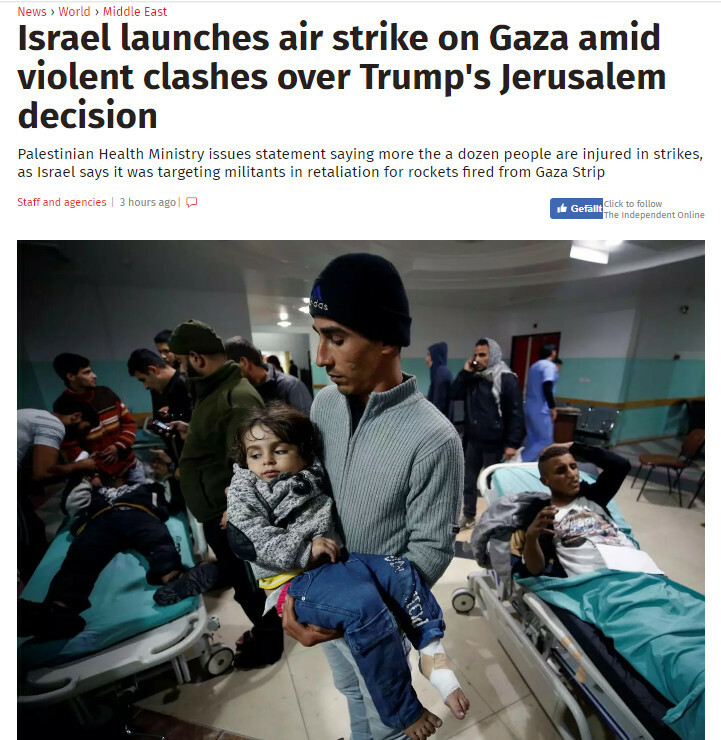 After president Donald Trump's declaration to move the U.S. embassy in Israel from Tel Aviv to Jerusalem and such recognize Jerusalem as the capital of Israel, riots have broken out all over Palestine and Gaza, leaving a violence toll of two deaths and more than 750 wounded up to now. Protests emerged as well in Berlin, Istanbul, London, Kairo and Kuala Lumpur, the capital of Indonesia and which is the most populated Islamic nation. While the Arab world is showing its embarresment and Palestinian president Mahmud Abbas refuses to meet with U.S. vice-president Mike Pence on his coming visit to the Middle East, Hamas and Hezbollah leadership are calling for a new Intifada or violent uprise against Israel. Jerusalem doesn't belong to the possessions of "Trump". 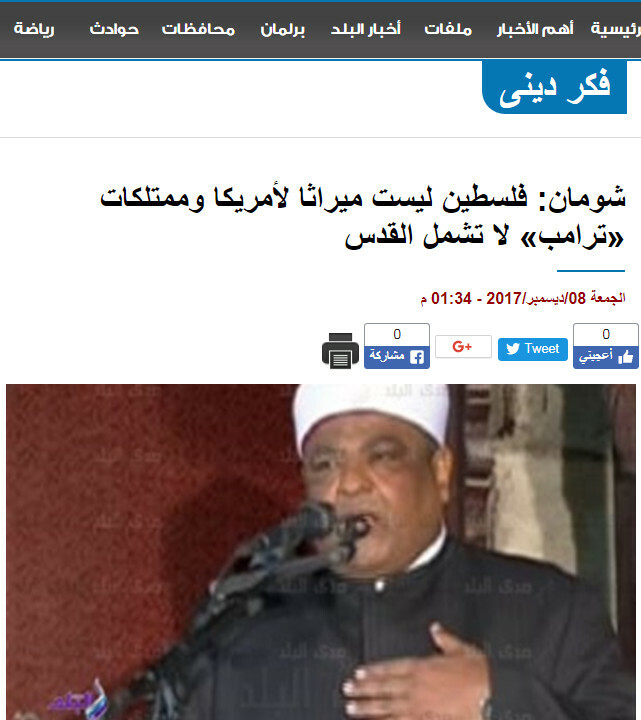 Dr. Abbas Shouman is deputy director of the famous and influential Islamic University Al-Azhar in Kairo and a partner of the movement United Against Violence in the Name of Religion (UVNR). - By the way, the above quoted Arabic word ممتلكات can be used with the meaning of "colonial possessions". The quoted Arabic source added in another article that Egypt's government officially rejects the ‘illegal’ US embassy move to Jerusalem. 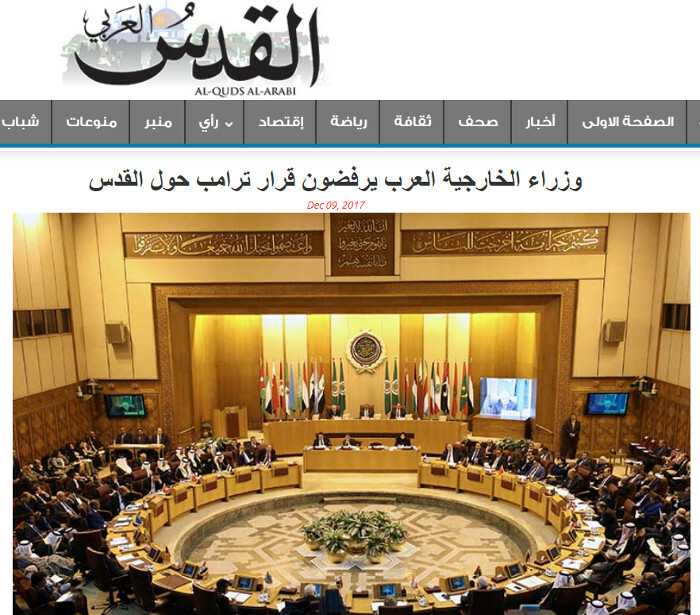 Arab foreign ministers reject Trump resolution on Jerusalem. The head of the Arab League has called US President Donald Trump's decision to recognise Jerusalem as Israel's capital "dangerous and unacceptable" and a "flagrant attack on a political solution" to the Israeli- Palestinian conflict. The statement by Ahmed Aboul-Gheit, the regional bloc's secretary-general, came at the start of an emergency meeting of foreign ministers from 22 Arab states in Egypt's capital, Cairo, on Saturday. Aboul-Gheit said Trump's decision was "against international law and raises questions over American efforts to support peace" between Palestine and Israel. 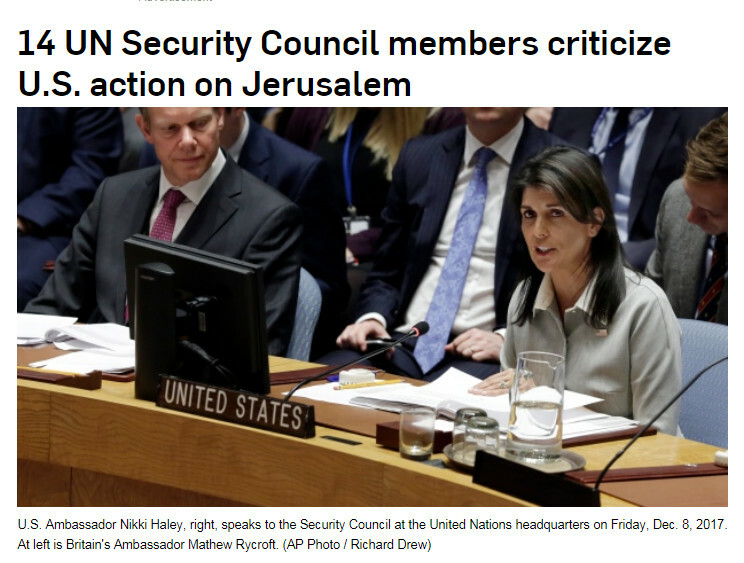 The shift in US policy "undermines Arab confidence" in the Trump administration and "amounts to the legalisation" of the Israeli occupation of Palestine, he added. The following news were published only some hours ago on late December 7, 2017. Reuters news agency report from December 6, updated on late December 7, 2017. Senator Tammy Duckworth, a decorated veteran of the Iraq War, is scared — scared that the Trump administration may be getting the US into a devastating war with North Korea without much of the public noticing or seeming to care. 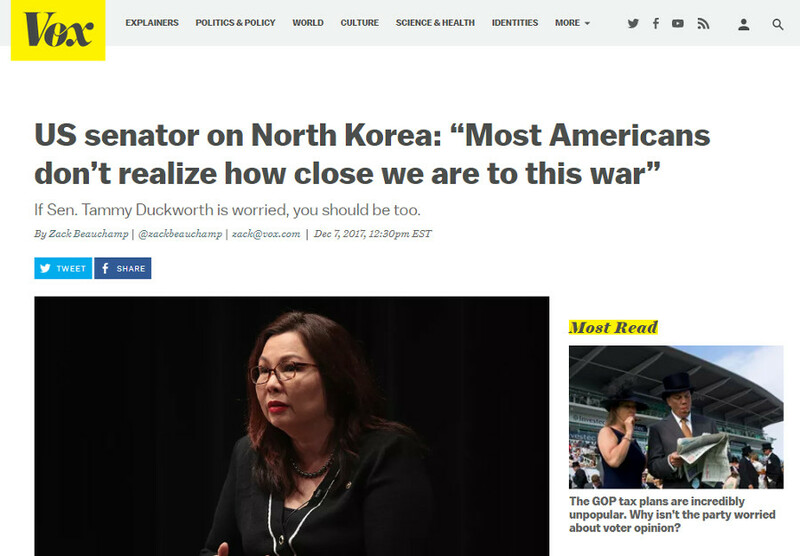 Duckworth, who lost both of her legs after her helicopter was shot down by insurgents, has closely followed both aggressive rhetoric from the White House and the way the US military has been approaching the Korean Peninsula. She believes the events of the past six months indicate that President Trump might be willing to actually launch a preventive strike on North Korea, despite the real chance that it could trigger a nuclear exchange. 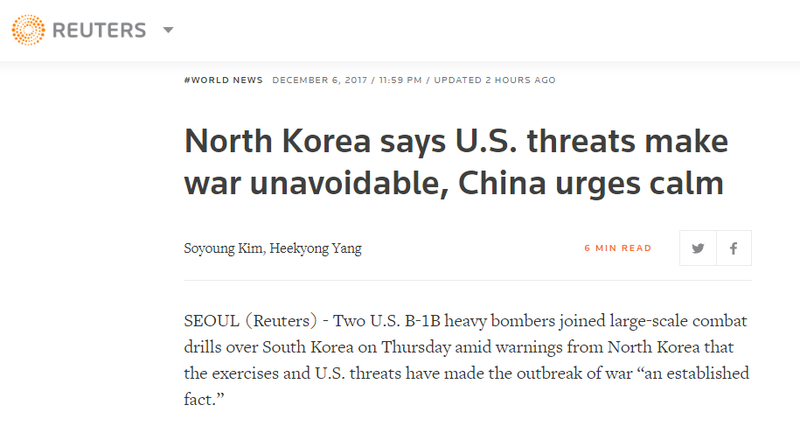 While U.S. and South Korean air force and navy units are amassing near the border to North Korea in the greatest show of military strength ever experienced since the Korean War in the 1950ies, China did something it's never done before to warn the U.S. about fighting North Korea when it started its own military drills in the Yellow Sea, close to the Korean Peninsula. 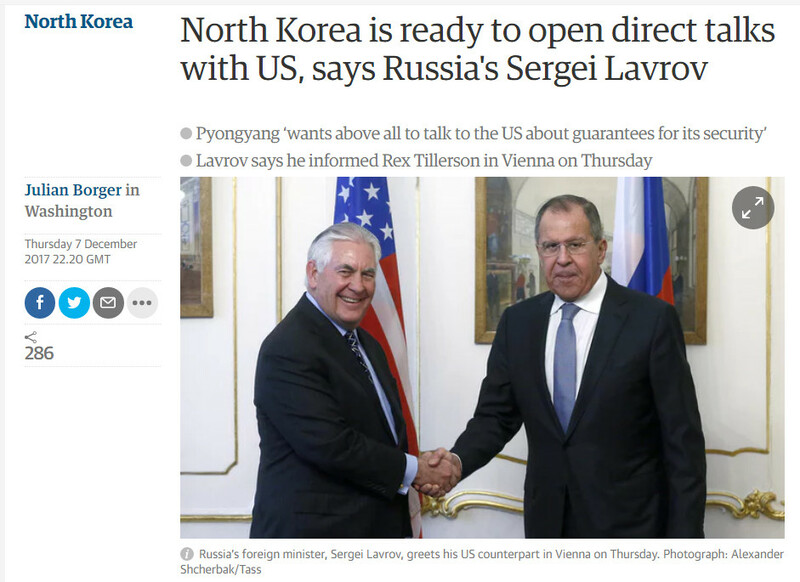 While Russia's navy just ended an amphibious landing operation in Kamchatka and Primorye province near to the country's border with North Korea after deploying hundreds of marines to that region, Russia's deputy foreign minister Igor Morgulov announced that communication channels with North Korea are being held open to "exert influence" on Russia's neighbour and traditional ally in Pyongyang. 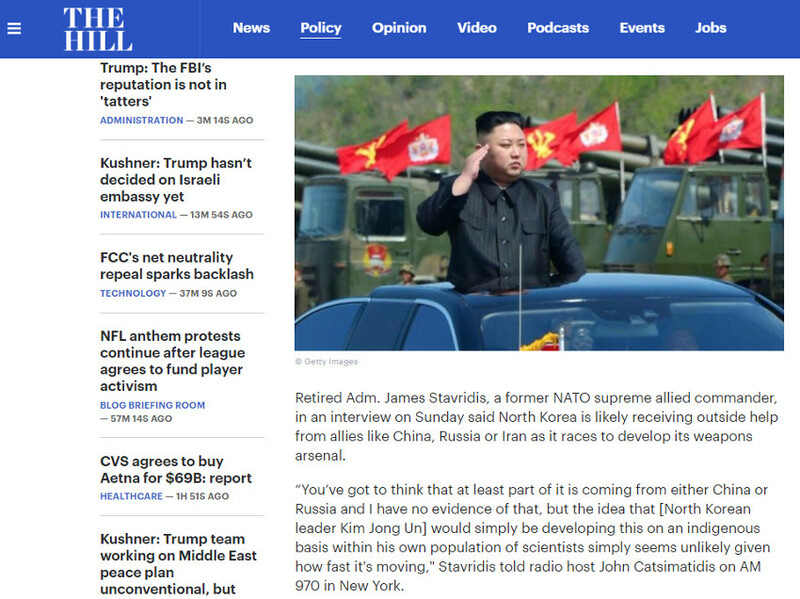 Even though Russia isn't amused about Kim Jong-un ignoring UN sanctions in his intention to create an accepted nuclear power, it seems to be still providing the rogue country with oil derivates and which hasn't been declared illegal by the international community up to now. 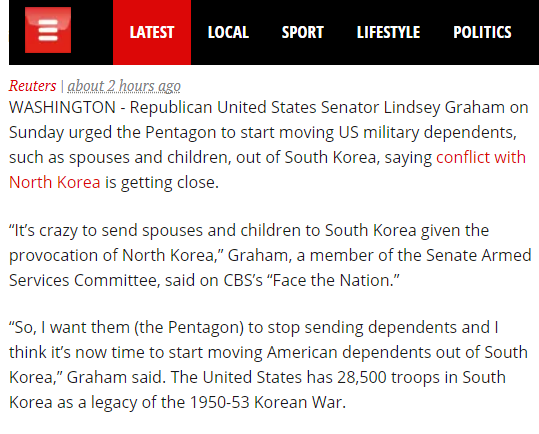 That comes at the same time when a U.S. Republican senator in Washington DC made his thoughts public that it was now the right time to repatriate family members of U.S. military personnel from South Korea. As North Korea is still unwilling to join an open dialogue with the U.S. and their partners to solve problems or, at least, show restraint in its nuclear ambitions, there seems to be no room left for any peaceful solution whatsoever. Therefore, it is no longer a question of whether there will be war, but rather when it would start. One might even be inclined to demand the parties involved in the conflict to come to terms, this way or the other, such that information-mining journalists and bloggers could get some sleep before the really bad news arrived. Elementary knowledge on the protection from nuclear weapons. 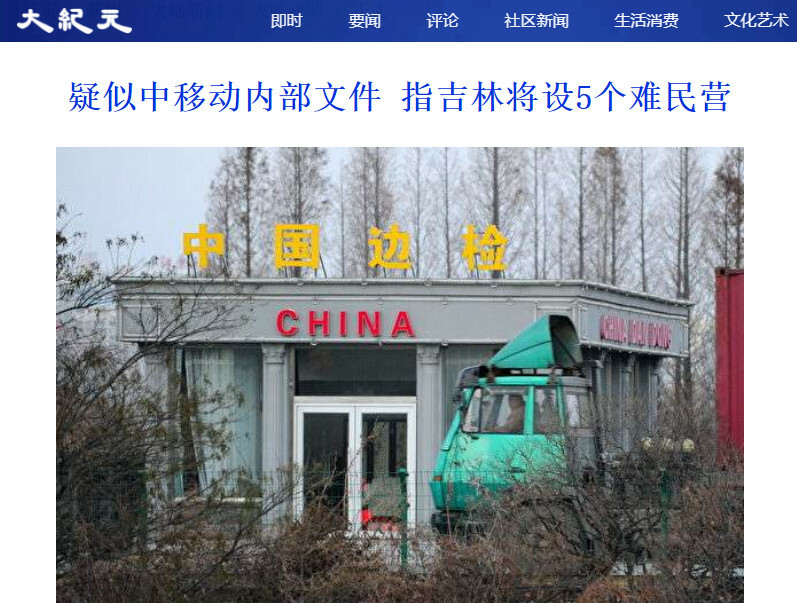 A "Jilin Party News" report is discussing how to protect from nuclear weapons. The situation on the Korean peninsula is far from encouraging. 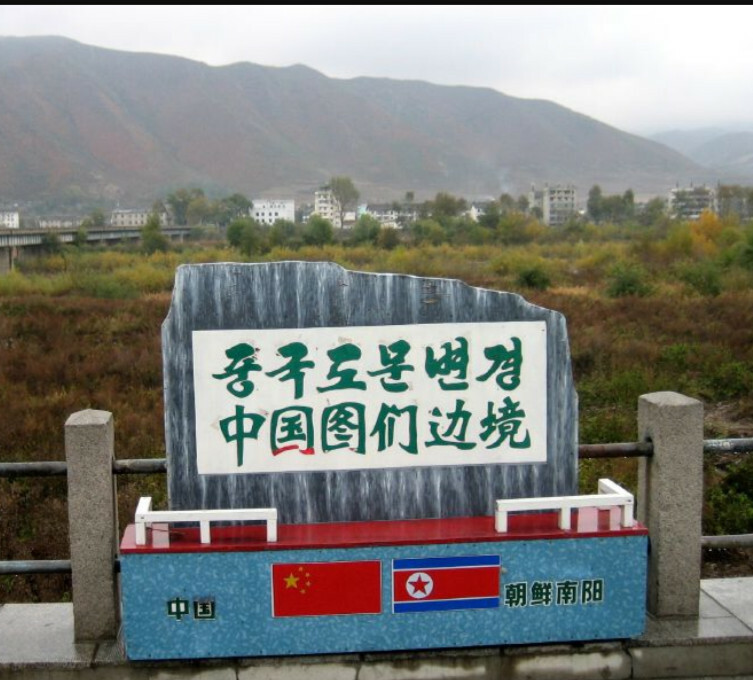 Inscription stone marking the border of China and North Korea in China's Jilin province. stop at a barricade, his remains were saved by his party. 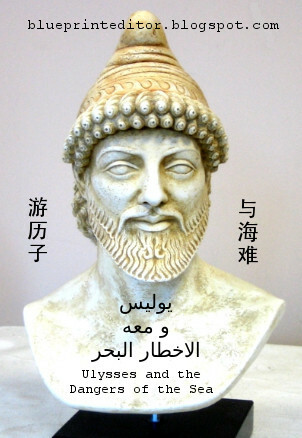 قال قيادي في جماعة الحوثي، إن الرئيس اليمني السابق، علي عبدالله صالح قتل، الاثنين، خلال محاولته الهروب من صنعاء إلى منزل له في ضواحي العاصمة. 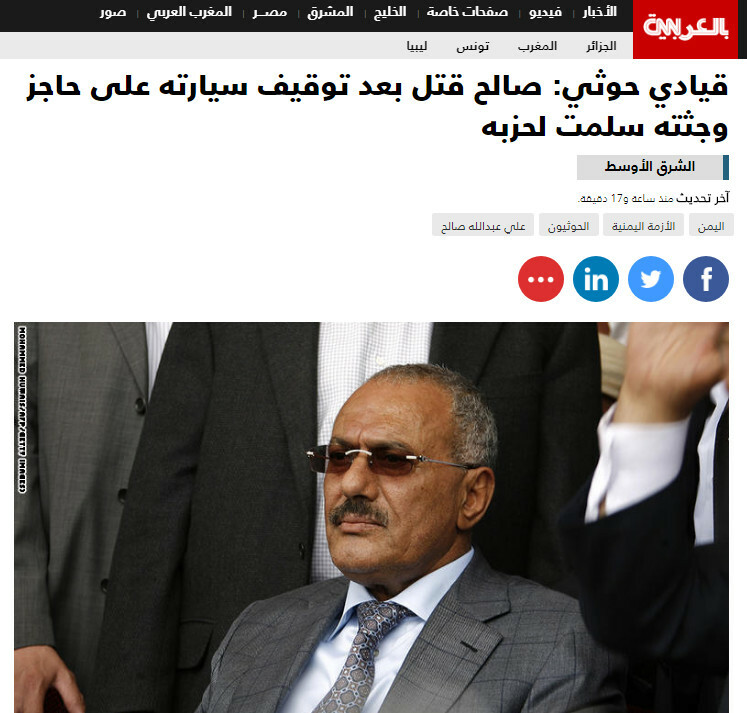 The command of the Houthi community told that former Yemeni president Ali Abdullah Saleh was killed on Monday [December 4, 2017] when he tried to escape from Sanaa to his residence in the suburbs of the capital. Abdullah Saleh had been forced to resign as Yemen's president during the Arab Spring. In his final days as a president, he had found temporary shelter in Saudi Arabia. Later Saleh underwent different alliances including a long-standing one with the Houthi tribes and which resulted in civil unrest. When a Saudi-UAE alliance started airforce operations in favour of the new president Hadi and against the Houthies who seemingly enjoyed Iranian support, Saudi bombardment triggered off a bloody war that left the Yemeni people in a desolate state. Now that Abdullah Saleh, once again, changed sides by approaching Saudi positions he was assassinated by Houthi rebels. 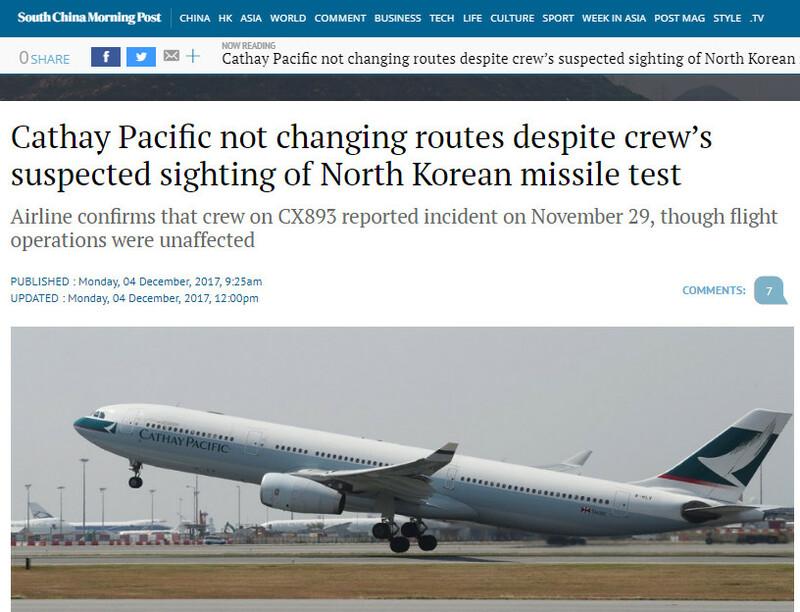 Described by Pyongyang as its "most powerful" missile, the 29 November launch ended up in Japanese waters but flew higher than any other the North had previously tested. Cathay Pacific cargo flight CX096 left the company's operational home base of Hong Kong for Anchorage in Alaska at about 11pm on November 28. 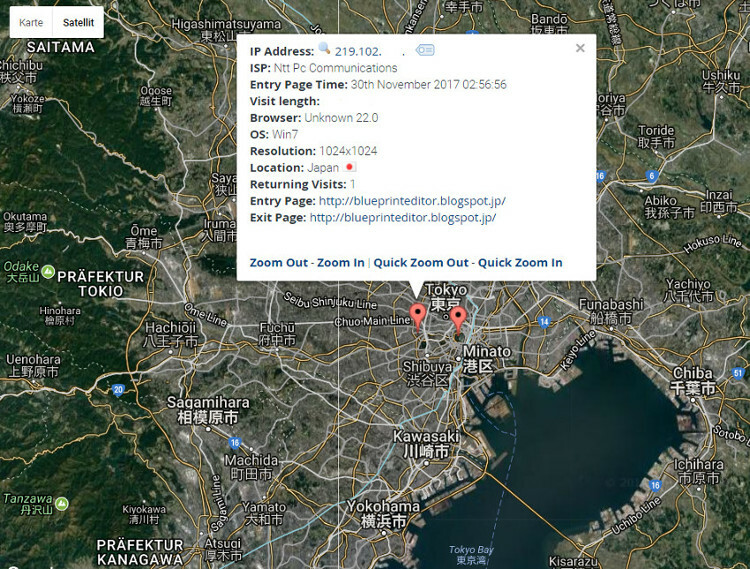 It was over Japan when the missile was launched, according to flight trackers. 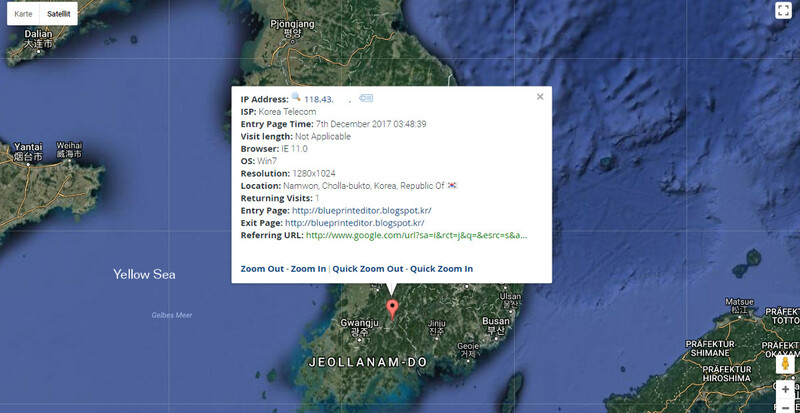 According to a BBC report published this morning, the launch was reportedly also witnessed by two South Korean aircraft en route to Seoul from the US. 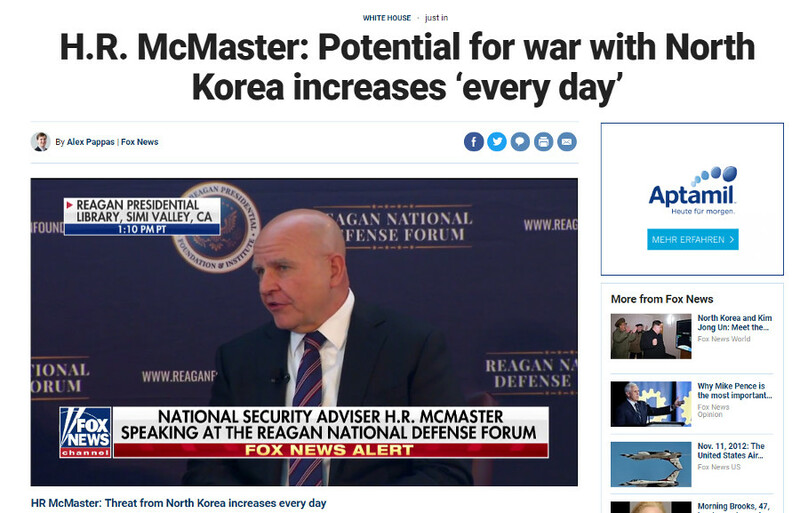 That evaluation of U.S. president Trump's national security adviser comes only days after North Korea launched its most advanced ballistic missile and which should even reach U.S. east coast townships. ... amid North Korea's wolfish howling. 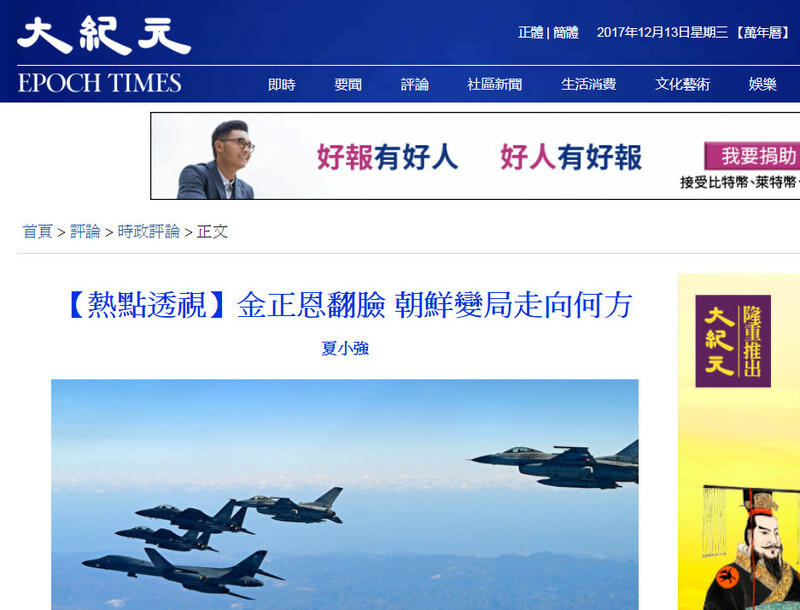 The Chinese language article is mentioning latest deployment of more than 230 U.S. warplanes including F-22 "Raptor", F-35 stealth fighters and B1-B bombers to South Korean bases. 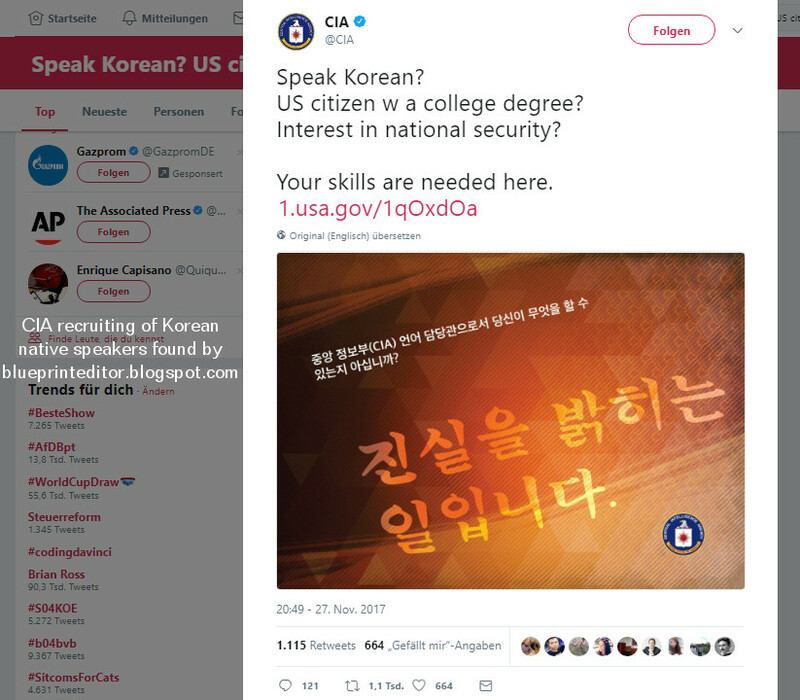 Alleged CIA recruiting of Korean native speakers on Twitter (November 27, 2017). Sen. Lindsey Graham, R-South Carolina, said the United States is "running out of time" when it comes to North Korea and that pre-emptive war is "becoming more likely" as the country's weapons technology "matures." Ex-NATO commander: N Korea likely getting help with nukes, rockets from China or Russia. 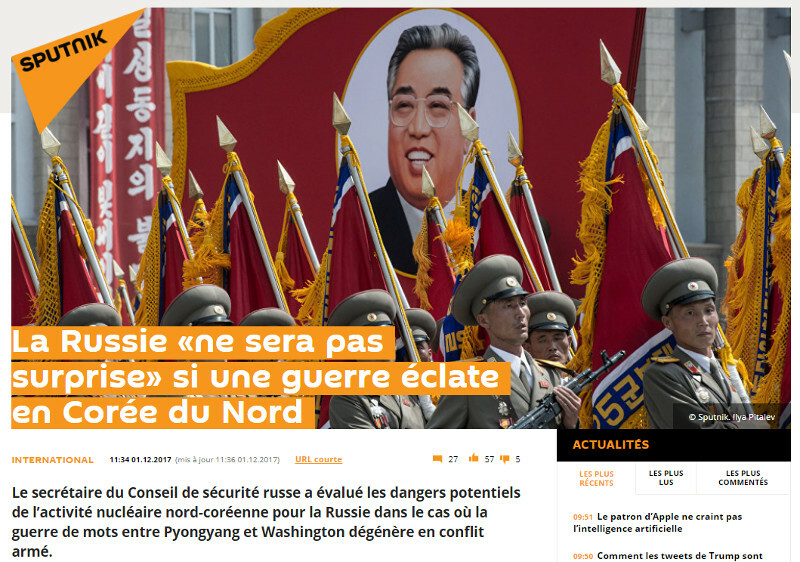 La Russie «ne sera pas surprise» si une guerre éclate en Corée du Nord. Russia "wouldn't be surprised" if a war started in North Korea. Un conflit militaire sur la péninsule coréenne figure parmi les scénarios envisagés par la Russie, qui calcule les risques afin de ne pas être prise au dépourvu si cette éventualité venait à se produire, a affirmé Nikolaï Patrouchev, secrétaire du Conseil de sécurité russe, dans une interview à Sputnik. A military conflict on the Korean peninsula counts among the scenarios considered by Russia that is estimating the risques for not being taken by surprise if such possibility became reality. This is what Nicolai Patrouchev, secretary of Russia's Security Council, said in an interview granted to Sputnik. Last update added on December 2. - The Hwasong-15 is a new type of intercontinental ballistic missile and an upgrade of Hwasong-14. 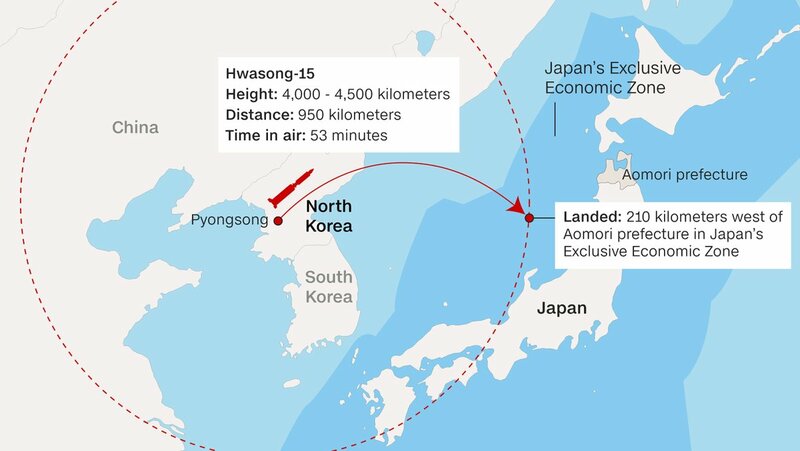 - The missile reached a height of 4,475 kilometers (2,800 miles), higher than ever before, and splashed down off the Japanese coast, within the country's Exclusive Economic Zone. - The missile was fired on a lofted trajectory, where the missile flies very high to cover a relatively short horizontal distance. David Wright, an expert with the Union of Concerned scientists said that if it had been fired on a standard trajectory, the ICBM would have been capable of traveling 13,000 kilometers, or 8,100 miles. - In comparison with earlier tested missiles, the Hwasong-15 can hold more fuel and payload, and its flight should be more stable due to a more sophisticated propulsion system using two instead of one engines in combination with additional steering engines. - South Korea immediately responded with a "precision missile strike drill," matching the same flight distance. 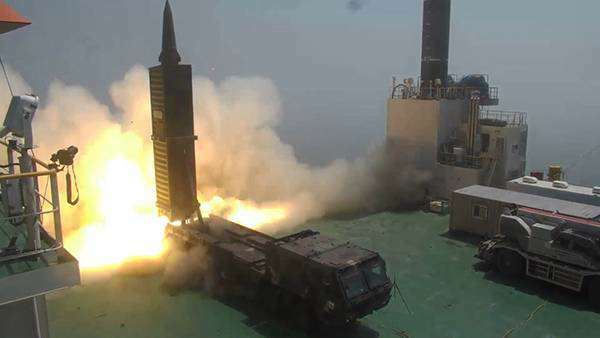 In a joint operation lasting 20 minutes after N Korea's ICBM launch, one "Dark Warrior - 2" type of ballistic missile, one "Sea Star - 2" ship-to-ground missile and one "SPICE - 2000" missile were fired by allied units. How many would die or get wounded in a N Korean nuclear attack ? 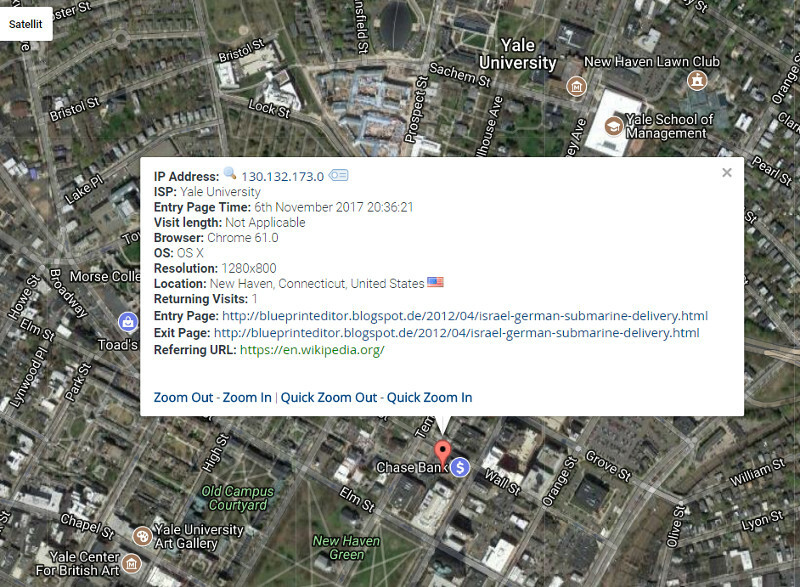 - Look at the map ! one million people would die or get wounded within 24 hours. however, will possibly do something desperate. China Cutting Ties with N Korea ? One of Australia's leading strategic analysts has warned there is a real prospect of 'serious conflict' between the United States and North Korea next year. The head of the Australian Strategic Policy Institute, Peter Jennings, said he's pessimistic about the next six months. 'As we move to the mid part of 2018 the North is going to be that much closer to perfecting the one or two areas of technology it needs to perfect in order to have a reliable and credible nucelar weapon able to attack the United States,' he said. Such information fits with evaluations made by other sources, saying that military preparation for war would take about six months from now. Important Updates added on November 26. 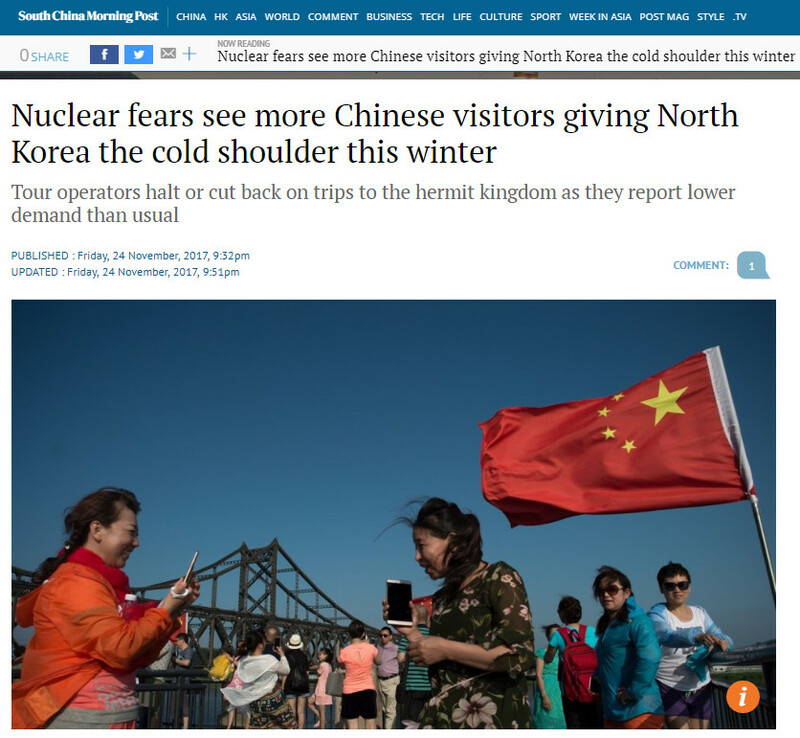 Is China cutting off traffic to North Korea for further sanctioning and isolating the regime of Kim Jong-un as U.S. president Trump demanded during his recent visit to Beijing, or is China rather decided to avoid getting directly involved in a major military conflict between North Korea and the alliance of America, Japan and South Korea ? China is temporarily closing its main road connection with North Korea, an official said on Friday. Foreign ministry spokesman Geng Shuang said the Sino-Korean Friendship Bridge, or China-North Korea Friendship Bridge, across the Yalu River at the Chinese city of Dandong will be closed while North Korea repairs the approach road on its side. Geng said that “after the maintenance, the bridge will reopen for passage,” but gave no date for the reopening or other details. The bridge closure comes after state-owned airline Air China suspended flights Tuesday between Beijing and North Korea due to a lack of demand, deepening the North's isolation amid mounting UN sanctions. Beijing is North Korea's only significant ally but has grown increasingly frustrated over its nuclear and missile tests that have brought a threat of war and chaos to China's north eastern border. In what was seen as a bid to improve relations, the head of the ruling Communist Party's International Department travelled to Pyongyang, North Korea's capital, last week. Few details have been released about his itinerary, including whether he met with North Korean leader Kim Jong-un. The trip followed a visit to Beijing earlier this month by US President Donald Trump, who renewed calls for China to step up pressure on North Korea to end its missile and nuclear programmes. On November 24 China Customs reported that trade contacts between China and North Korea have gradually been reduced and dropped in size since October. 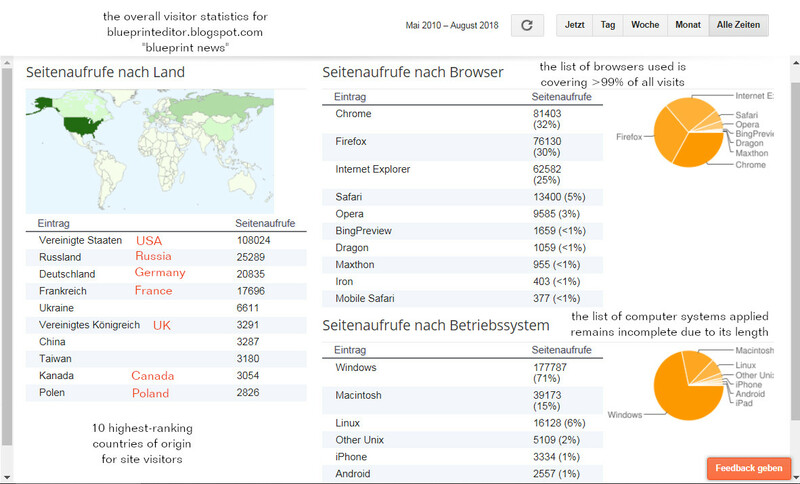 That month, for the first time, neither iron ore nor lead or coal was imported by China. By that move China has implemented the United Nations' resolution on sanctioning North Korea. In June China's [market organizations] for crude oil and natural gas stopped selling petrol and diesel oil to North Korea. of joint U.S. and South Korean troops at the border to North Korea. Song Tao, director of the international liaison department of China's Communist Party, visited North Korea as Xi Jin Ping's special envoy. He returned to China on November 20 [in the evening]. Neither the Chinese nor the North Korean side spread information on whether Song Tao had met with Kim Jong-un or not. However the U.S. immediately listed N Korea another time on the blacklist of terrorist states. What kind of signal such proceedings are likely to release ? Cyber-crime is now a billion-dollar industry for North Korea. Cracking down on this criminal enterprise presents a strategic opportunity to apply further pressure on the Kim Jong-un regime. Hard currency generated from cyber-crime is undermining global efforts to impose economic pressure on Pyongyang. As sanctions are imposed against its formal economy, North Korea has increased the scale of its illegal businesses. The massive criminal operation may be equivalent in size to the annual budget of the North Korean nuclear weapons program. To generate such tremendous returns, North Korean hackers steal bitcoin, hold data ransom, and rob foreign banks, including the brazen heist of a sovereign nation’s central bank that netted $81 million. 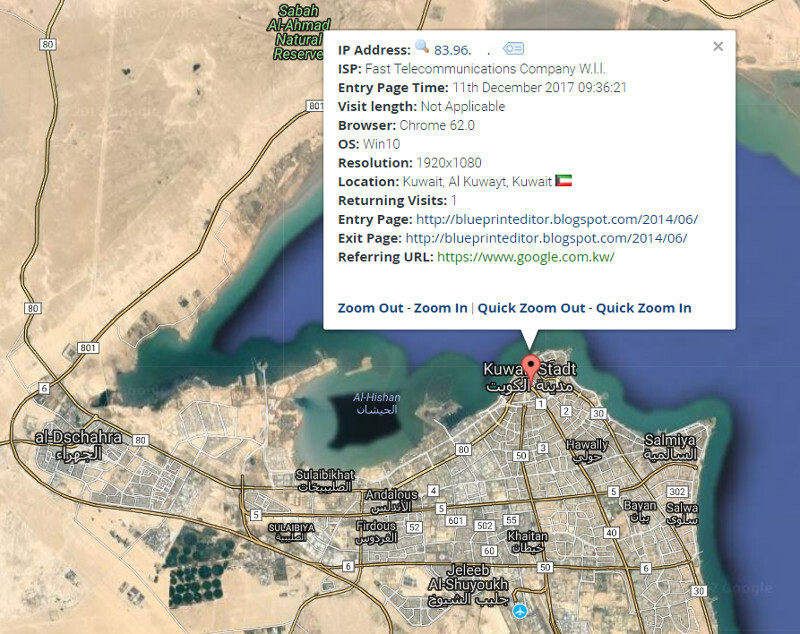 Evidence suggests the spree of bank robberies continues across Australia’s region, with attacks against banks in the Philippines, Vietnam, and Taiwan. The UK government has now also attributed the global WannaCry ransomware attacks that in May crippled thousands of computers to North Korea. North Korea's leadership views its cyber-capabilities as a unique advantage that it can deploy without fear of retribution. North Korea is one of the least ‘connected’ countries in the world, while its adversaries (countries such as Japan, South Korea, and the US) are internet dependent. And that dependence makes for vulnerability to cyber-attacks. In the event of a conflict, North Korea likely believes it could remotely attack and degrade the financial systems, telecommunications infrastructure, energy utilities, and media networks of the US and its allies. Pyongyang has previously demonstrated this capability against South Korea, while WannaCry came perilously close to threatening human lives in hospitals around the globe. China is, of course, key to any success with North Korea. To encourage China's leadership to take action, any legal case must present evidence of North Korean activity taking place on Chinese soil. 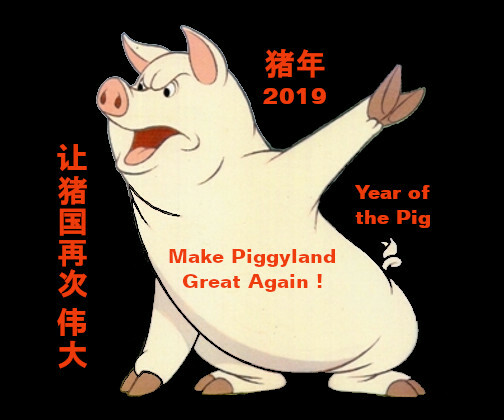 The Chinese may find it difficult to support such criminality, especially when it threatens the stability of the global financial sector or undermines Chinese commitment to global law and order. China may be willing to bring charges of its own or deport those responsible for the attacks. 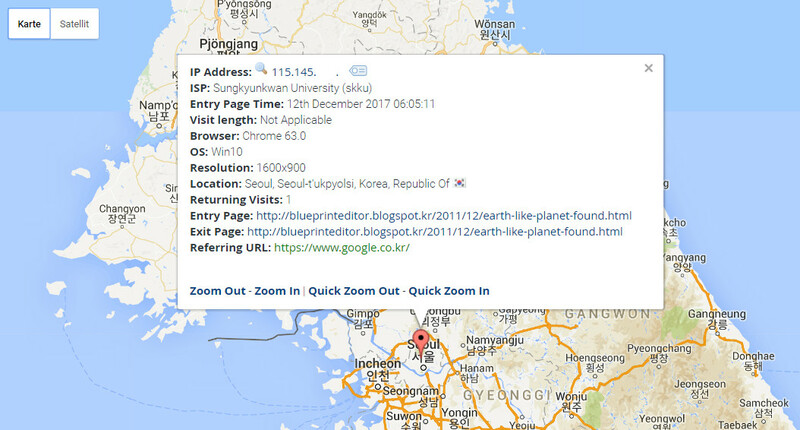 Analyzing the hacking tools of N Korea's "Lazarus" group mates. just passing above Japan's northern region of Hokkaido. Visitor from Washington DC interested in president Trump's diplomacy of name calling. Lebanon - Saudi Coup d'État ? As confrontation grows between Saudi Arabia and Iran, the unexpected retreat of Lebanon's prime minister Hariri while being in Riadh for talks with the Saudi Crown Prince has triggered off rumours of a militant Saudi move to replace Hariri with his hard-line brother Bahaa who might abandon a coalition of national agreement with Hizbollah that is seen by the Saudis as a protegee of Iran, both, in Lebanon where it was acting as a political party in Hariri's ruling coalition and in Syria where the military branch of Hizbollah is fighting side by side with Iranian units. Animosities between Saudi Arabia and Iran derive as well from Iranian support for Houthi rebels in Yemen who are still being fought by a Saudi-led alliance. 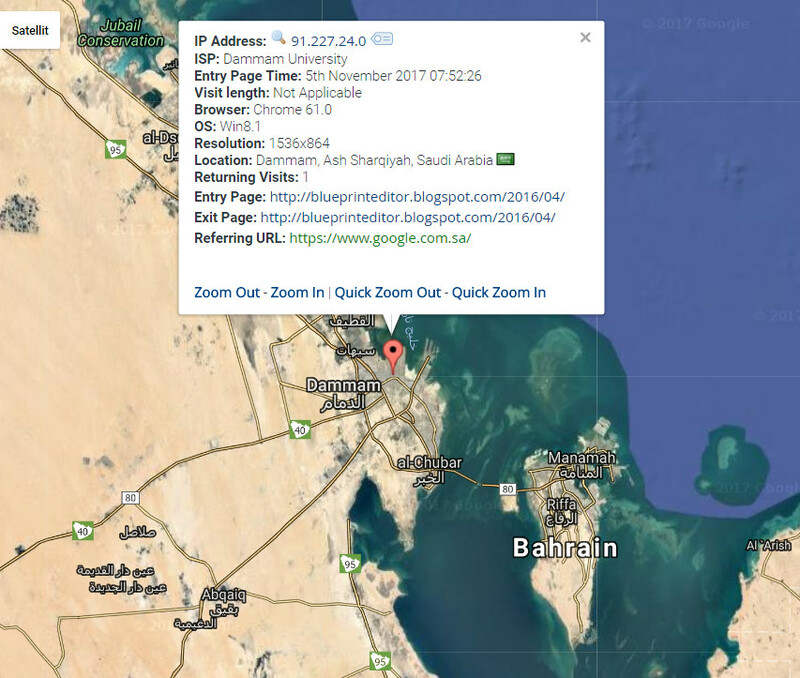 Tensions accelerated only recently when a missile from Yemen targeted the Saudi capital of Riadh. Rumors of the virtual kidnapping of Lebanon's prime minister Hariri, who resigned last Saturday while in Saudi Arabia, have rocked the Arab world; Lebanese officials worry that Saudi Crown Prince Mohammed bin Salman, or MBS as the 32-year-old crown prince is known, wants to force Lebanon into his confrontation with Iran. Some Lebanese analysts complain that the Saudis treat the Hariri family, who have been bankrolled by Riyadh for decades, almost as a wholly owned subsidiary. 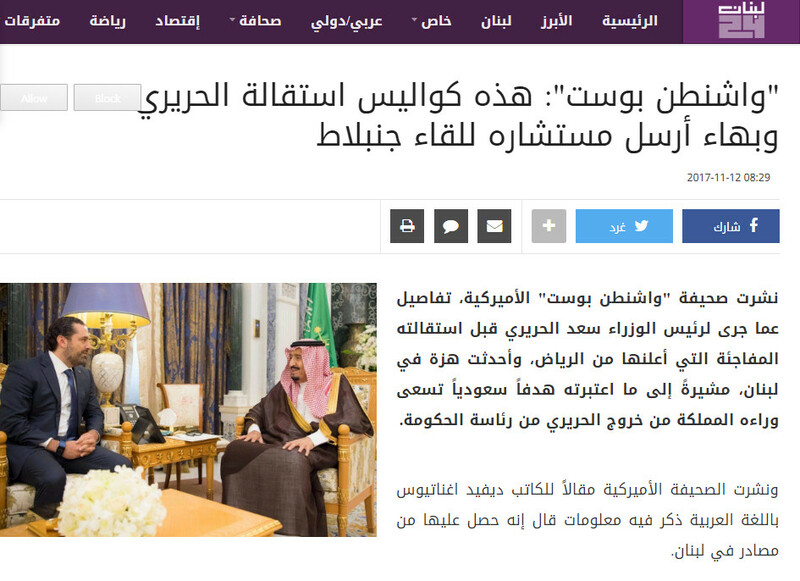 According to well-informed Lebanese sources, the tale began on Monday, Oct. 30, when Hariri traveled to Saudi Arabia for a personal meeting with MBS. With the crown prince was Thamer al-Sabhan, his key adviser on relations with other Arab states. Lebanese sources believe Hariri’s harder-line older brother Bahaa may be Riyadh’s candidate for prime minister. Other Hariri relatives were summoned to Riyadh last week but refused to go; it’s said that Bahaa was already there. The sources also say that Bahaa sent Safi Kalo, a close adviser, to meet secretly 10 days ago with Druze leader Walid Jumblatt to discuss future strategy for Lebanon, but Jumblatt is said to have left the meeting, refusing to discuss the subject. 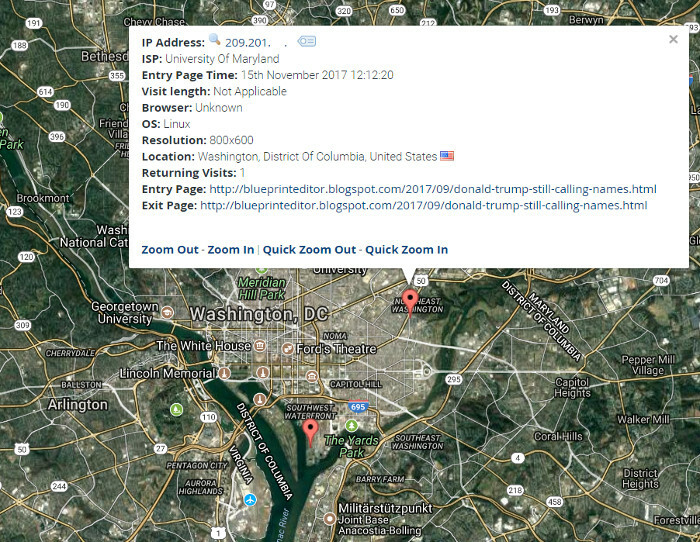 The Washington Post article appeared on November 10, 2017, in an English and Arabic version. Saudi [Arabia] Stopped Lebanon's Prime Minister by Force. and Bahaaa sending his coucillor to  Jumblatt. The American journal published an article written in Arabic by David Ignatius where he mentioned information which he said derived from Lebanese sources. the situation of Hariri is "incertain and confuse". On Saturday [i.e. November 11], Lebanon's president Michel Aoun said, if all that was published or is possibly being published about Saed al-Hariri is "not reflecting reality", it might be because of confusion over his situation since he declared the retreat from the presidency of the nation's [council of] ministers last week. as [Japan's leader] Abe introduces sanctions. The time for "strategic patience" with North Korea is over, U.S. President Donald Trump said today after winning Japan's backing on his policy of considering all options to rein in the rogue state. 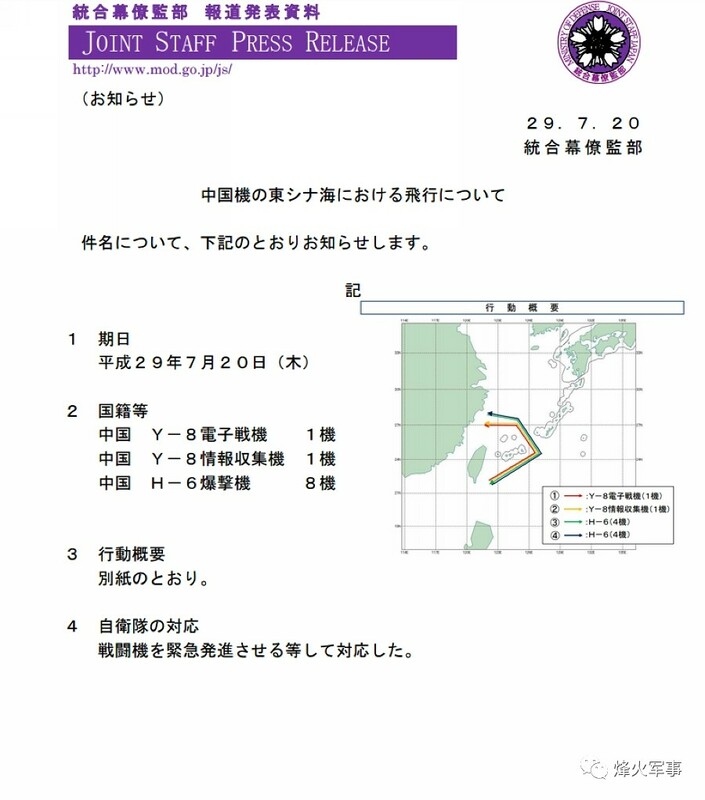 could be blown with the wind into the direction of Japan. Defence Minister Marise Payne said the drills would enforce UN Security Council Resolution 2375, concerning "the interdiction of vessels carrying suspicious cargo". Australian frigates HMAS Melbourne and HMAS Parramatta will undertake the training alongside South Korea's Sejong the Great destroyer ship and USS Chafee, an Arleigh Burke-class destroyer. The training mission came as the Pentagon outlayed the grim choices facing the US and its allies in stopping North Korea, saying that a full ground invasion of the country was "the only way" to be certain it could destroy all of Pyongyang's nuclear weapons. 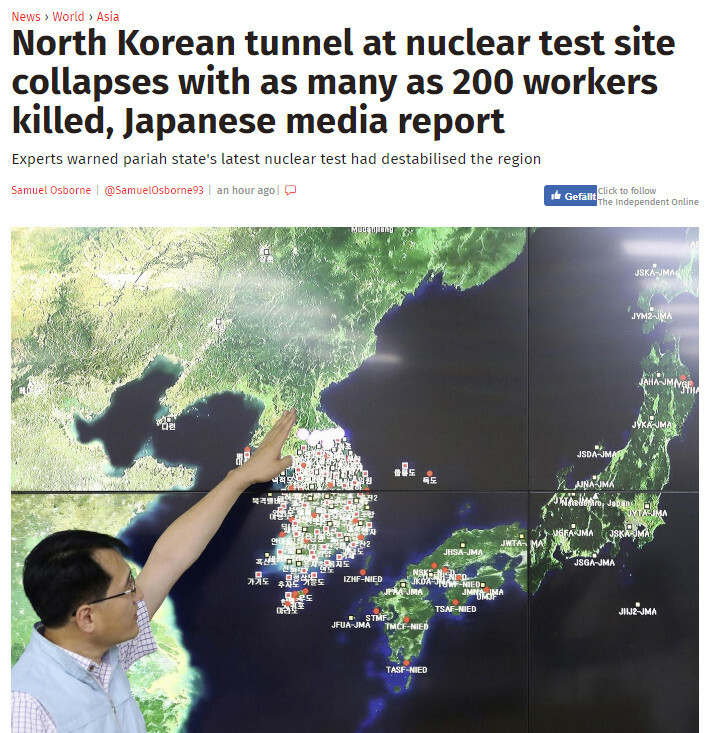 As many as 200 construction workers are feared dead after the collapse of a tunnel at a nuclear test site in North Korea, according to a Japanese media report. The tunnel was being built at the Punggye-ri test site when it collapsed, according to a report on Japan's TV Asahi citing an unnamed source in North Korea. It said that about 100 people were initially trapped in the tunnel and another 100 may have been killed by a second collapse as they tried to rescue the first group. 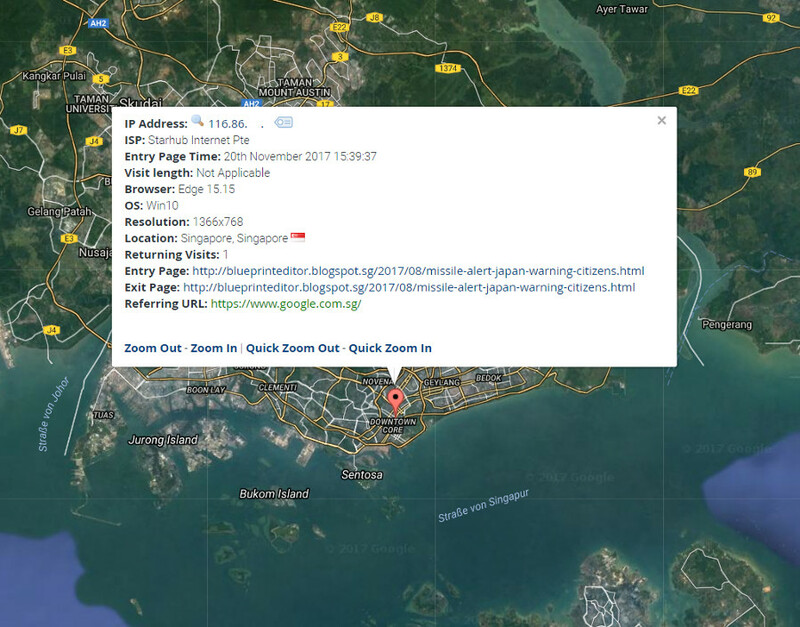 The broadcaster said the collapse took place around 10 September. The incident should be consistent with recently observed seismic shocks. and were followed on their way to the Japanese Sea. As the Russian Ministry of Defence declared on October 31, two Russian TU-95 MC had been tracked down on their flight near Japan by U.S. and Japanese fighters. 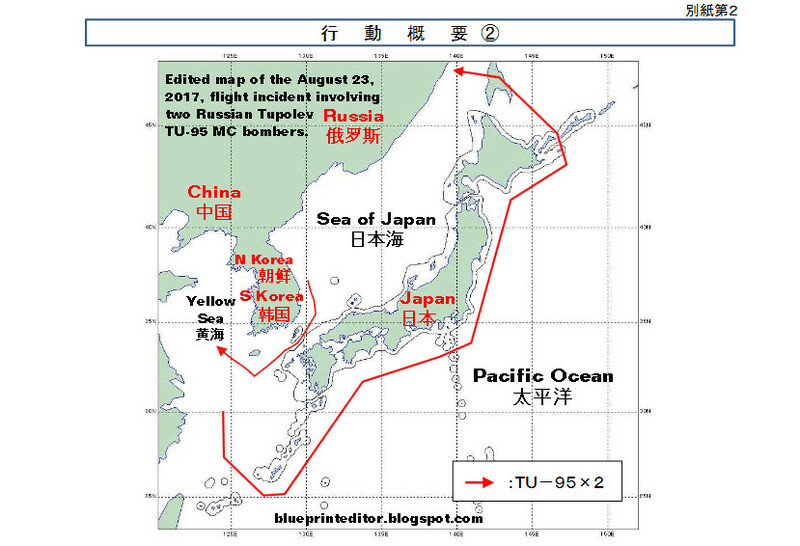 According to a Japanese Joint Staff press release two Russian TU-95 had been observed in the region on August 23, 2017, while surrounding Japan on a flight that took them from Russia's Far East following the South Korean coastline of the Japanese Sea to the entrance of the Yellow Sea and then back home following the Japanese coastline on its Pacific Ocean side. 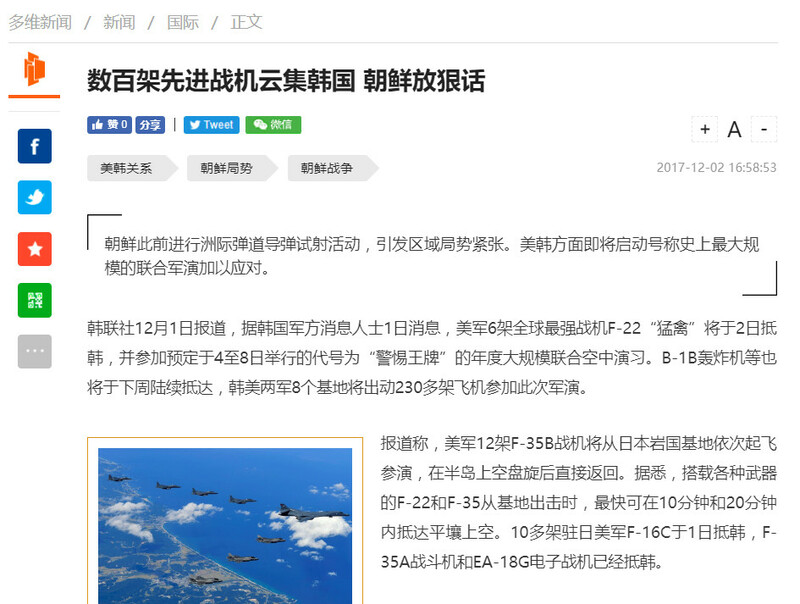 Another Japanese report from August 24 confirmed the presence of six Chinese H-6 bombers in the same region that day. Patrol flights of Chinese Hong H-6 bombers have been earlier observed at the southern border of Japan and near the U.S. airforce base of Guam. Their flight routes are marking the border of China's traditional region of influence in the South China Sea (南中国海) and which is now regularly questioned by the U.S. and their allies.